This is a wonderful ground floor holiday maisonette situated in an ideal area, being only a short walk to shops, bars and restaurants. It is a five minute drive to the nearest blue flag beaches and the Zenia Boulevard shopping centre. 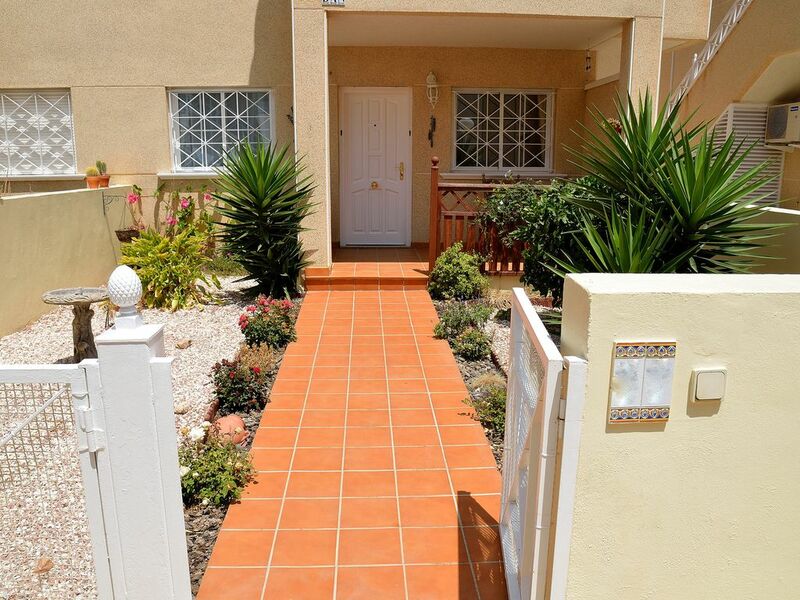 The property is next to a bus route with an hourly service to both beach and Zenia Boulevard. The famous Playa Flamenca Saturday market is only a ten minute stroll and it is less then ten minutes drive to the three golf courses in Villamartin, two of which are championship courses. Alicante airport is 40 minutes drive and Murcia airport is only a 20 minute drive. The adjacent public park is a popular place to socialise and play petanque making this an ideal family holiday location. Furthermore the lively coastal City of Torrevieja with many bars, shops, restaurants and casino is only a ten minute drive. We love this area, for us it is perfect with its blue flag beaches, many restaurants, and ease of accessibility to shops and championship golf courses. The pool and garden area is amazing, we are looking forward to spending as much of our free time as possible staying at the property. Each time we visit we enjoy exploring the area and each time discover something new, being served by two airports is also a great bonus. The property is located on the very friendly La Concha community, the adjacent park is in part maintained by La Concha residents, it has a children’s play area and is busy during the summer as a meeting place and recreational area. Bathroom with bath/shower over, wc, bidet and wash basin. Lounge dining room, one three seat sofa and one two seat sofa, 32" flat screen TV, over fifty English satellite channels, coffee table, dining area: small table with four dining room chairs. Air conditioning / heating system, ceiling fans. Fully equipped kitchen with electric oven, gas hob, electric kettle, fridge/freezer, microwave and toaster. There are three golf courses within a ten minute drive, two of which are championship courses, namely: Villamartin, Las Ramblas and Campoamor. There are other golf courses in the area including the well known La Manga club golf course which is about a forty minute drive south. Notes on accommodation: There is a coin meter which activates the air conditioning / heating unit. The meter is collaborated to use less credit than power consumed. We do not smoke and request that our guests do not smoke inside the accommodation. Outside: Outside there is a private shaded seating area with table and two chairs, well maintained garden. Utility Room: The utility area is accessed via the kitchen and houses the washing machine, ironing board and clothes line. Cleaning / Towels / Linen / Maid service: There is a €55, cleaning charge to be paid locally on arrival, the property is cleaned after each changeover for the next guest. Towels and linen are included in the rental price. Other: There is a hair dryer and electric iron available for guests in the living room and sun loungers stored under the single beds. Lovely apartment great hosts,close to everything would defiantly stay again ,simply perfect . The apartment was spotless and very well equipped. Our hosts Ricky & Pauline went above and beyond their duty, helping us as much as they could. Would definitely return as there was so much in the area we missed. We were picked up at the airport, Ricky was already waiting for us. The apartment was ready for us, it was very clean and tidy and had everything we needed. It had a lovely terrace and sun loungers and sun chairs. The air conditioning was fantastic, really cold and didn’t take long to cool the apartment. There is a group of shops and a fantastic restaurant and Chinese takeaway across the park, (3 minute walk). I would recommend a car as there are lots of beautiful places to visit. Overall would definitely recommend this apartment. Adrian the owner was very quick to respond to all messages and Pauline and Ricky were there if needed. Overall excellent. The apartment was spotless upon arrival and a pleasure to stay in. 5th time to the area using different rentals but this was by far the best. Lovely little apartment with everything and more that you need. Pool is about a 30 second walk and was clean and very big. Will be back next year! I very much enjoyed my stay at La Concha. It was like home from home. The house is very well kept and provides a very comfortable stay. The complex is well situated and in easy reach of amenities, while providing the peaceful and tranquil escape I was looking for. Fantastic apartment, a bit dark on veranda due to bushes over growing. The bushes are jasmine and an orange tree. They are grown in the local style to provide shade and privacy when using on the veranda. The jasmine releases a lovey scent every evening. We cut them every time we visit, however we do not employ a full time gardener as the cost is prohibitive. The Blue Flagged Cala Estaca Playa Flamenca beach is about a five minute drive or about a twenty-five minute walk, a bus stops near the apartment every hour and stops near the beach and Zenia Boulevard. Alicante and Corvera airports are about a fifty minute drive, transfers can be arranged for up to four passengers The smaller Murcia airport is about twenty minutes drive and transfers can also be arranged. Distances: Torrevieja, which means 'old tower' is a ten minutes drive, it is a beautiful town, and home to a marina, waterfront market, shops, cafes, restaurants, bars, casino and a beautiful church square. It's exquisite palm-lined promenade and board-walk are perfect places to go for an evening stroll. Flamenca Beach commercial centre is one if the main locations for bars, shops and restaurants. This complex has a variety of restaurants famous for their cosmopolitan cuisine as well as there being live entertainment in the many bars. Booking Notes: A deposit of £50 per week is required to secure your booking with the balance plus a fully refundable security deposit of £100, paid with the balance within four weeks of arrival. The bond will be refunded on your return, subject to no damage or excess cleaning reported. Changeover Day: We are felxible in respect of changeover days to allow guests to take advantage of deals offered by the airlines. Notes on prices: Prices are for the property per week in UK pounds. Cleaning is on top of this at €55, plus a refundable damage bond of £100. The air conditioning / heater is operated by a euro coin operated meter. It is collaborated to use less credit than power consumed.